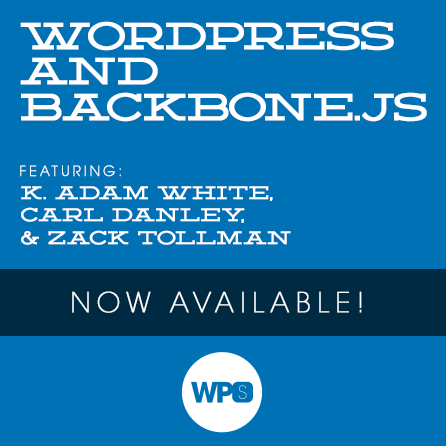 Join K.Adam White, Carl Danley, and Zack Tollman for an exciting and informative introduction to Backbone.js. They'll take us through the basics of Backbone (what it is, how to use it) and provide useful examples of how you can implement it in your themes and plugins. This month our focus is on writing cleaner, more responsive WordPress-based applications by using Backbone.js. If that sounds intimidating to you, then perhaps I should introduce our speakers. Our expert presenters for this month are K.Adam White, Carl Danley, and Zack Tollman. These three guys are hands-down the best presenters I’ve met who can take a complex idea and explain it in simple, easy-to-follow terms. This session is actually an introduction to Backbone, a primer to help us all get going on the right foot. K.Adam will take us through the basics of Backbone – what it is, how it works, how it is similar/different to other libraries like jQuery – and then Carl and Zack will demonstrate ways you can start putting it to work immediately in your themes and plugins. By the time the session is over you should know how to take an existing project (or start a new one) and integrate Backbone.js to either reduce code, improve performance, or both! This session will be broadcast live on January 25, 2014 starting at 1pm ET. How does Backbone differ from jQuery?